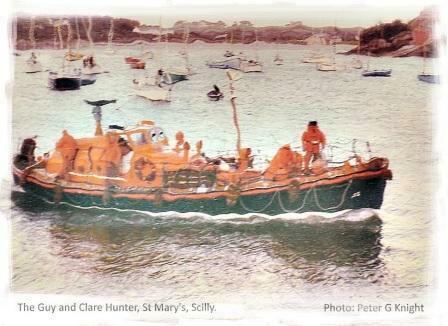 The Watson class 'Guy and Clare Hunter' was the Isles of Scilly lifeboat from 1955-1981. When I was small I met many of the crew and heard stories of some of their famous rescues. I remember seeing them setting off for, and returning from, some of those missions. In those days the crew were called by the sounding of maroons and the boat launched down the slipway from the lifeboat house that is just visible in the background of the photograph below. I am not sure exactly when I took this particular photo, but I think it was during the Fastnet rescues of August 1979. I think the figure on the Bow is Richard Lethbridge, and the Coxswain at that time was his brother Matt Lethbridge, hence the reference in the poem. My heroes, then, as now.